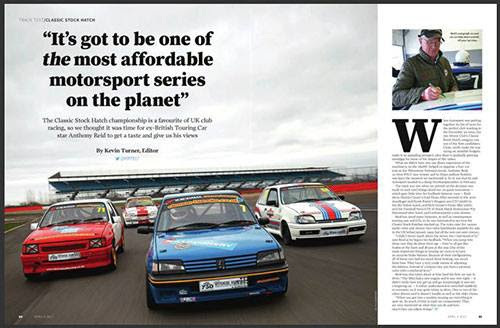 After sampling a selection of cars from the Demon Tweeks | Yokohama Classic Stock Hatch Championship as part of a comprehensive comparison feature for Autosport Magazine earlier this year, touring car ace Anthony Reid couldn't resist the offer to try his pick of the bunch - a Peugeot 205 GTi - in proper competition. The former Le Mans podium finisher will be competing in rounds 7 & 8 of the 2017 championship, at the 750 Motor Club's June 17th/18th meeting at Brands Hatch Indy. Reid will be driving Derek Rozier's Peugeot; the sister car to Matt Rozier's back-to-back championship winning machine of 2015 and 2016, and the feature will be covered in Motorsport News.